- Over the door hanger holder lets you store your bags, coats, jeans, and more and get rid of clutter. Keeps your home neat and organized. They are indispensable and perfect for every bedroom and bathroom in your house. Will not prevent your door from closing smoothly. This door hanger organizer helps to keep things in order and save space. Great for keeping garments smooth and reachable. It is convenient to use and will make your daily life easy. - Folding clothes rail is a multipurpose and unique rack that is hand crafted by home experts. It is made with the user in mind. The unique design allows the arm to fold away when not in use. Very neat with a touch of class. Featuring four practical hanger notches for clothes. Also comes in handy when you are ironing your clothes so they can cool off before placing them in the closet. No hardware or installation necessary, easy for use and remove. - Door hangers is a compact yet effective way to store all your clothing and stay organized. Creates more space to hang and organize clothes. It fits over the door perfectly so opening and closing the door doesn't present a problem. It can be used outside the door and planning your wardrobe for a trip. You won't have to throw your clothes on the floor when you are lazy to get them back into the closet. Your room will look super neat with this hanger. - Laundry hanger rack is a simple yet effective way to hang your laundry while preserving space. Versatile and durable. Keeps your suits, blouses, shirts, and trousers handy and unwrinkled. It is stylish and very functional in your laundry room. Just reach up and hang your clothes instead of reaching out to hang each article on the doorknob. There is no need for screws, nails or glue and no more running back and forth to the closet. 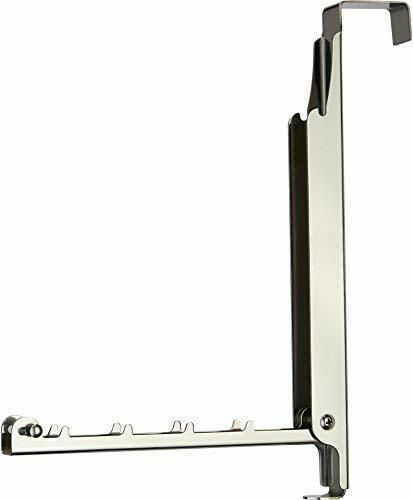 - Door hangers for clothes is made from premium grade steel and will compliment and style decor. Professional designer look and feel with a sleek brushed finish. It is rust resistant and carefully engineered with smooth steel that will not harm your wooden doors. Sturdy and steady with solid specialized construction. Will hold your heavy woolen winter coats and jeans without breaking or bending. It makes a welcome addition to any closet. Just hang it up! Warranty Tough durable construction and fine workmanship details are confidently backed by the manufacturer's risk-free lifetime replacement warranty that covers any defect in materials or craftsmanship in your investment when purchased from authorized sellers.